The post Bitcoin Price Support and Resistance appeared first on CCN: Financial Bitcoin & Cryptocurrency News. The post Peace & Stability through the Blockchain: Policing appeared first on CCN: Financial Bitcoin & Cryptocurrency News. How does bitcoin shape our perception of privacy in the digital age? Chainalysis co-founder Jonathan Levin explores. Despite criticism of bitcoin's approach to payments innovation, its development process may have advantages over existing methods, observers argue. The post Plug Pulled On Keza App Allowing Bitcoin Investing In Stocks appeared first on CCN: Financial Bitcoin & Cryptocurrency News. The post Russia’s NDS Uses Blockchain For E-Proxy Voting appeared first on CCN: Financial Bitcoin & Cryptocurrency News. Products that make it easier for users to purchase on mobile could drive that engagement. Those include PayPal’s new app and tools like one-click buy button OneTouch, both of which remove friction and make it simpler for users to purchase across their mobile devices. And that could bolster PayPal’s success over time, since the firm believes that a strong value proposition — added convenience — will lead to increased consumer use, which will, in turn, cause more merchant partners to begin accepting PayPal as a payment option. The firm is also doubling down on international growth in order to continue to accelerate TPV and add more services. Only 56% of PayPal’s active accounts are based in the US, indicating a strong and growing international presence. Digital remittance platform Xoom, which PayPal acquired in Q4 2015, saw record activations in Q1 and grew net active users by 70%. PayPal could leverage Xoom’s relationships with financial partners worldwide as well as its strong and growing user base to accelerate its growth outside the US. And PayPal continues to grow Venmo, one of its peer-to-peer (P2P) transfer applications. The app processed $3.2 billion in transactions in Q1, marking an increase of 154% YoY. 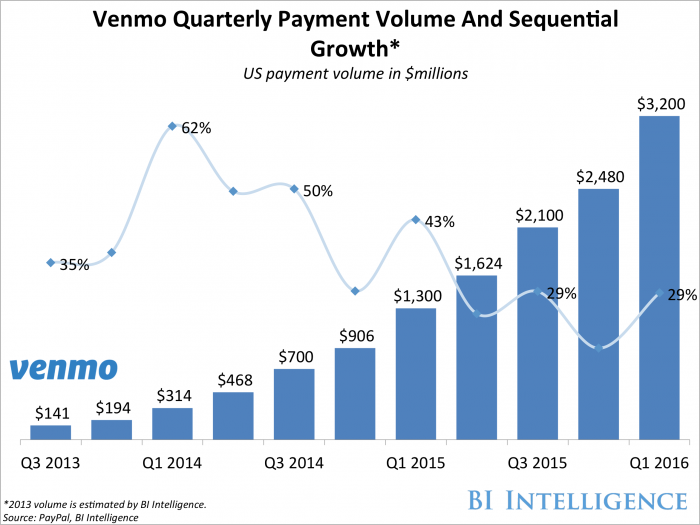 BI Intelligence previously estimated that Venmo's Q1 2016 volume would fall between $3.1 and $3.3 billion. 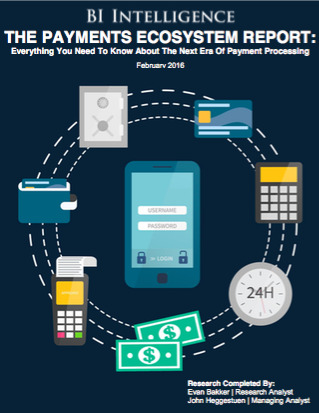 The service's volume and addressable base could continue to increase as the service’s in-app payment platform, called Pay With Venmo, continues to grow. Pay With Venmo is currently available to 550,000 Venmo users, but should launch to the service’s entire base by the end of 2016, according to The Wall Street Journal.